Emelyn Stuart has run The Ocktober Film Festival, a showcase of emerging filmmakers, since 2013. Each year, she’s rented venues for it. One year, she recalls the lights shutting off; they had run over their allotted rental time, and there were no exceptions. “I said to myself, I will never, never, never have to go through this again,” she says. 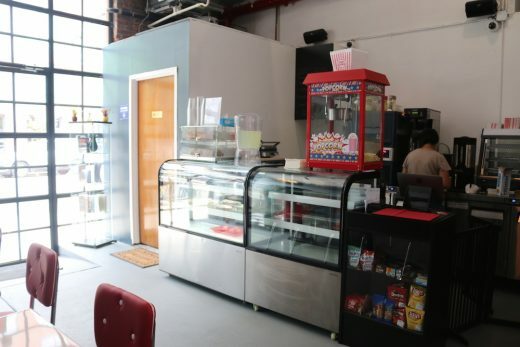 “I will find a home for this festival, and [the filmmakers] will be able to stay as long as they want, and they will be able to talk about their films for as long as they need, and I’m not going to be rushing them.” She found that home in Stuart Cinema and Cafe, her own space in Greenpoint she opened at the start of September alongside Chief Operations Officer Carl Gilbert Jr. 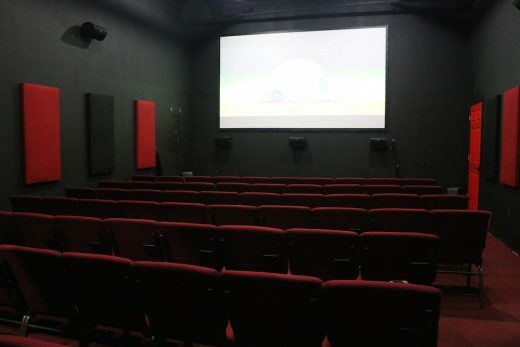 While she was initially eyeing the old Sunshine Cinema space in the East Village, she quickly found that between Manhattan rents and renovations, the only way to make it work would be to charge exorbitant rental and ticket fees, which would “defeat the purpose of what [she] was trying to do”: provide a space for independent artists to show their work and maybe even profit. The Dominican Bay Ridge native set her sights on Brooklyn, and found a warehouse on Greenpoint’s West Street, near the water. She took this “blank canvas” and transformed it into a cafe (open during the day for those who want to drop in for coffee or use wifi and work) and 70-seat screening room with a 4K projector, 160” screen, surround sound, and even a desktop computer with Final Cut Pro and Adobe Premiere, allowing filmmakers to view and edit their work on a big screen prior to a public showing. Stuart’s focus is on indie film, but mainstream feature films also screen regularly, with lower prices than bigger theaters: $10 for adults, $5 for seniors, $6 for children, $3 for popcorn. Family-friendly films will make a consistent appearance; Stuart, who is a mother herself, has made this a priority, noting it can be hard to find entertainment that’s both suitable for kids and financially accessible for lower-income families. It’s also a place for artists of all disciplines to use, and get paid in the process. In addition to films, Stuart wants to make the space available for comedians, musicians, spoken word, parties, you name it. 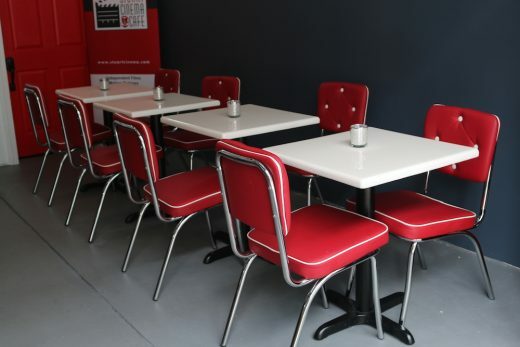 Their walls will feature a rotating selection of local art, which will also be for sale. Tired of how often she saw artists, from actors on indie film sets to singer-songwriters, working for free and not knowing how to change that, Stuart found taking matters into one’s own hands was often more fruitful than waiting for institutional forces to provide adequate compensation. The business-minded Stuart stresses the importance of investing in one’s art. She raises an eyebrow at artists who perform for free for years (or even pay for the chance to perform) and drop large sums on acting classes and voice lessons, yet are reluctant to pay to rent Stuart Cinema’s 70-seat space ($175 per hour with a two-hour minimum), where they can sell their own tickets and merchandise. 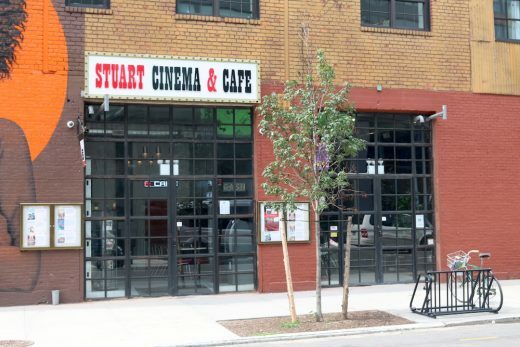 Stuart Cinema and Cafe is located at 79 West Street in Greenpoint; open from 10 am to 8 pm Sunday, 10 am to 10 pm Monday through Thursday, and 10 am to 11 pm Friday and Saturday. The Ocktober Film Festival is October 4 to 7, 2018.